Rage And Love with Plum & Cardamom (5.4% abv) is the latest in a series of fruit-flavoured sour ales. Revolution Series #8 (8.4% abv) is a double dry-hopped double IPA with lactose that is hopped with Citra and Simcoe. Hearts Collide 2017 (11% abv) is the latest vintage of the brewery’s popular Imperial stout, this one being a blend of stouts aged in bourbon barrels for 9 months and 24 months. 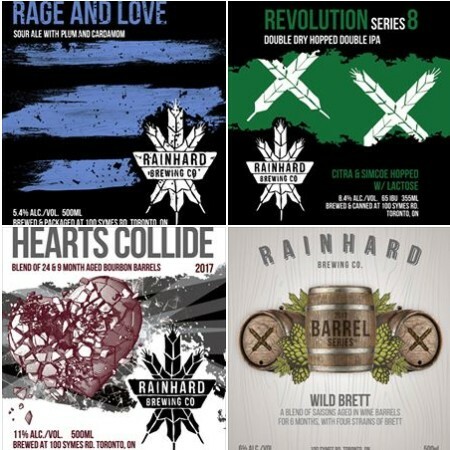 The three new beers will be available in bottles, and will also be on tap alongside a special line-up of other Rainhard beers including a limited amount of Wild Brett, a blend of barrel-aged saisons originally released last year for the brewery’s 2nd anniversary. The anniversary party will run from 12:00 noon to 8:00 PM tomorrow, will also feature food by Sul Irmaos and live music from Sam Cash & Kristian Montano. For more details, see the Facebook event listing.